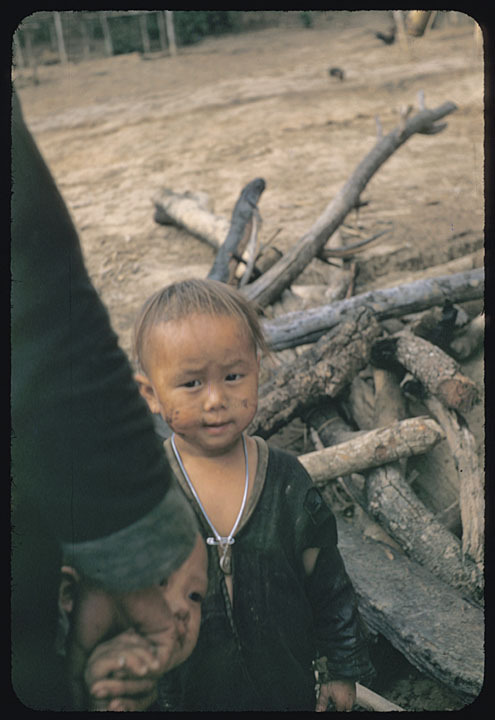 Cov duab nov tso rau nej saib xwb, txwv tsis pub muaj coj mus siv lwm qhov. 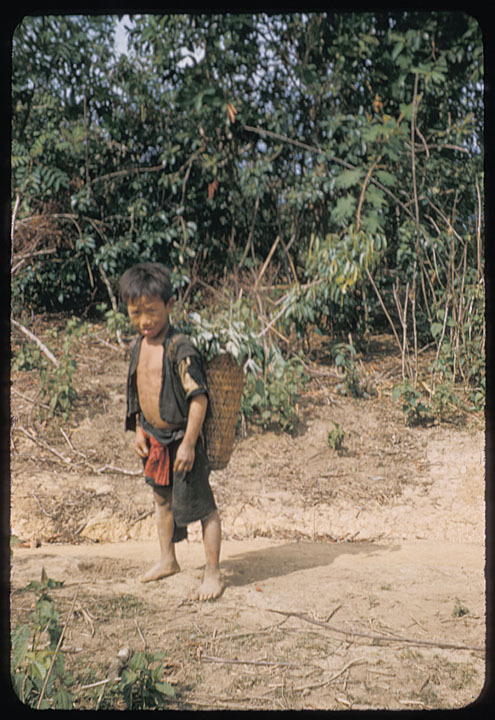 "From the Joel M. Halpern Laotian Slide"
Terms: This image cannot be copied or reproduced without the written permission of Joel M. Halpern (email: jmhalpern@anthro.umass.edu). Ashmun, Larry: University of Wisconsin--Madison. 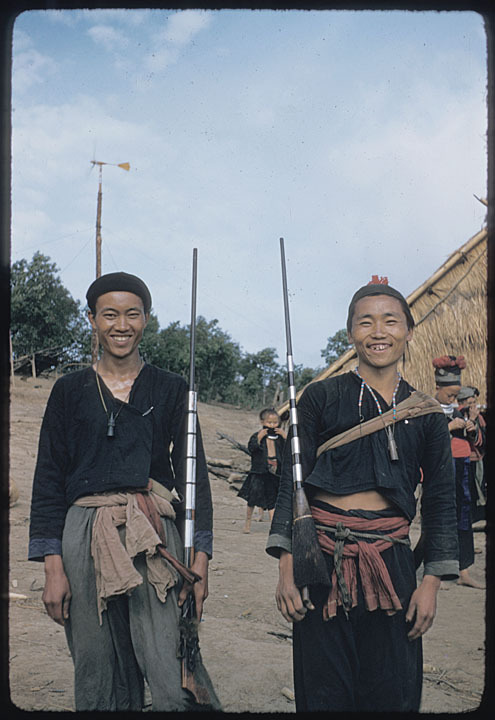 Libraries"
Zos Roob Nyuj Qus, ntsia mus rau tim kev tsheb Moos Loos rau Vees Cam. tab tom mus teev Ntuj los txog ntawm Nkias Keem Yaj lub txhab. 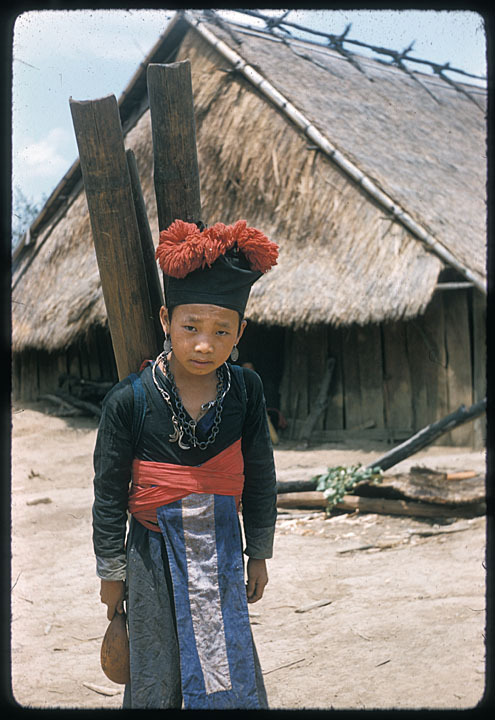 =Father Yves Bertrais and the Hmong people of Kiukacham have been to mass and they go to Mr Yang Kia Keng's barn. 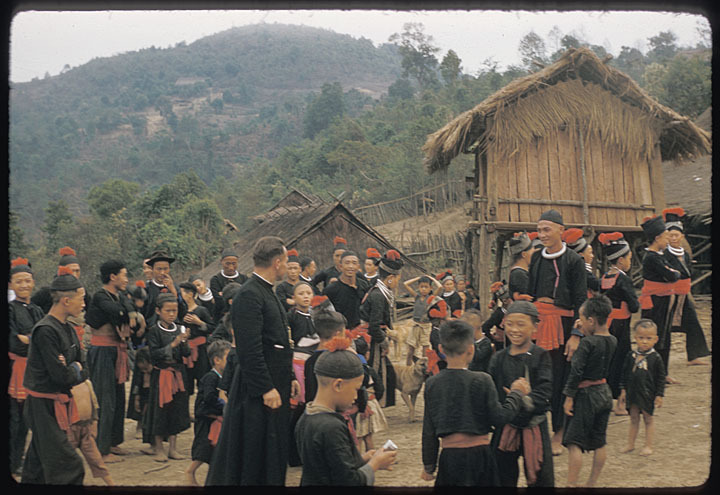 Father Yves Bertrais, of the Missionary Oblates of Mary Immaculate and one of three co-founders of the Hmong Romanized Popular Alphabet (RPA), with White Hmong villagers in Kiu Katiam. 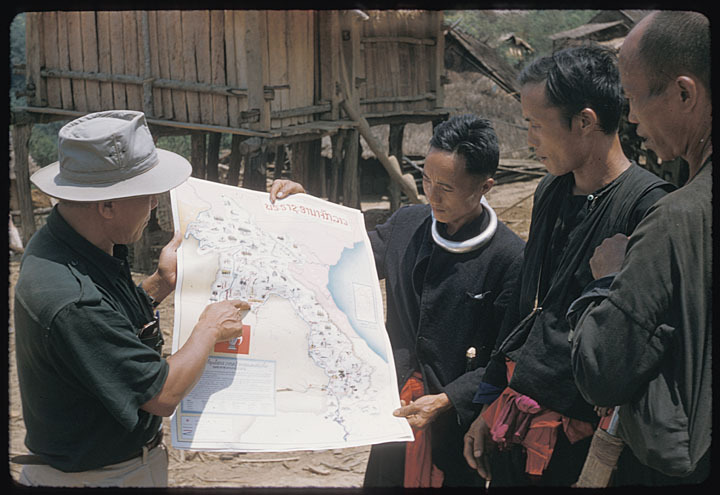 To the left of Father Bertrais are Song Tong Yang (Soob Tooj Yaj) (who now (2006) lives in Orleans, France) on the far left, Chong Khou Yang (Txoos Khwb Yaj) (deceased) to his right-front, and Kia Keng Yang (Nkias Keem Yaj) (deceased) holding his son Bee Yang (Npis Yaj) (Rockwall, Texas). 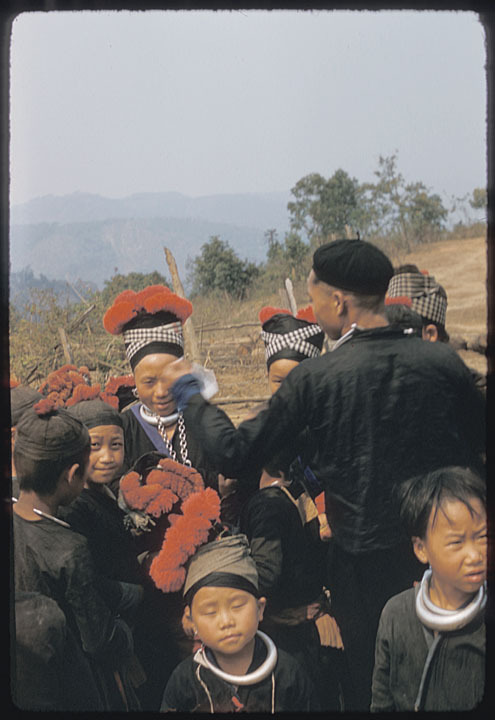 In the back behind Father Bertrais, looking toward him with his arms crossed, is Kia Thong Thao (Nkias Thoob Thoj) (deceased) with Va Khou Thao (Vam Khwb Thoj) (deceased) standing to his right wearing a simple black cap. 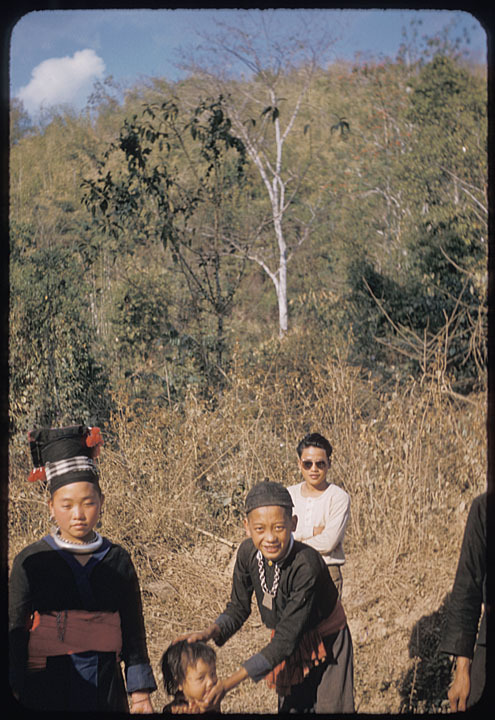 The young boy smiling in the foreground is Tong Yang (Tooj Yaj) (North Carolina). 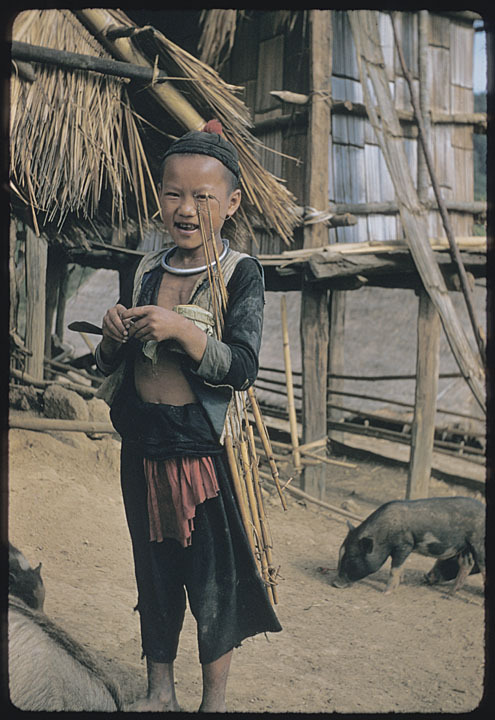 In the background, between Kia Keng Yang (Nkias Keem Yaj)'s rice shed and Cha Chai Thao (Tsav Ntxaij Thoj)'s house and running downhill, is a bamboo pipe which Father Bertrais introduced to the village in order to bring in fresh water. 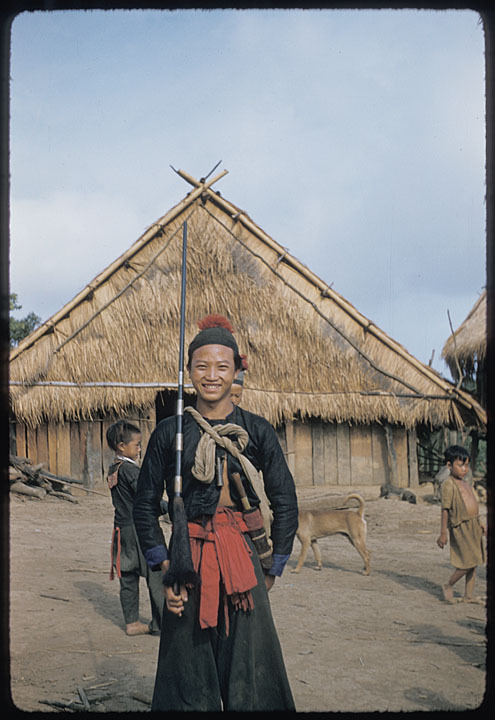 Tsuj Xyooj Yaj(Chu Xiong), Tsav Ntxaij Thoj(Ja xai Thor), Mos Xyooj (Mo Xiong), Nkias Keem Yaj(Kia Keng Yang), Npis Yaj (By Yang), Zam Muas Yaj(Ja Moua Yang), nyob ntawm Vam Khwb Thoj lub tsev. 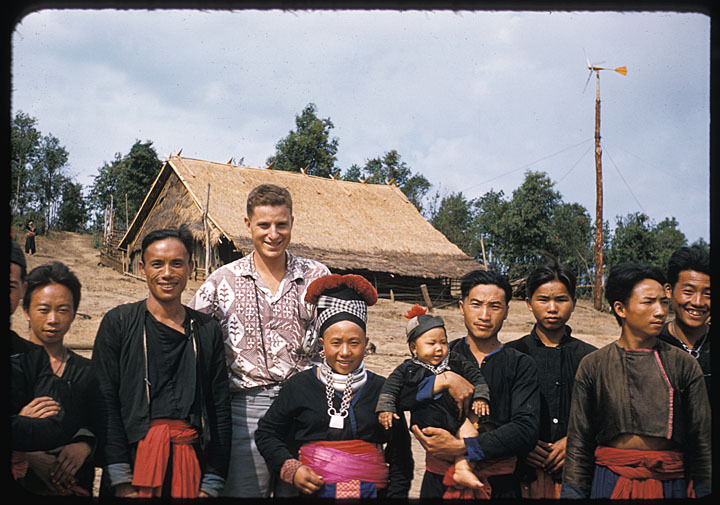 =Halpern is pictured here with a group of White Hmong in Kiu Katiam village. 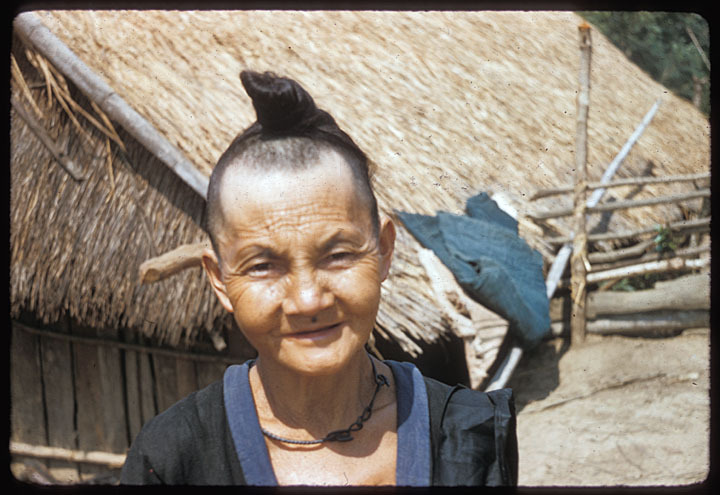 To the left of Halpern are Chue Xiong Yang (Tsuj Xyooj Yaj), who now (2006) lives in French Guyana, and Cha Chai Thao (Tsav Ntxaij Thoj) (deceased). 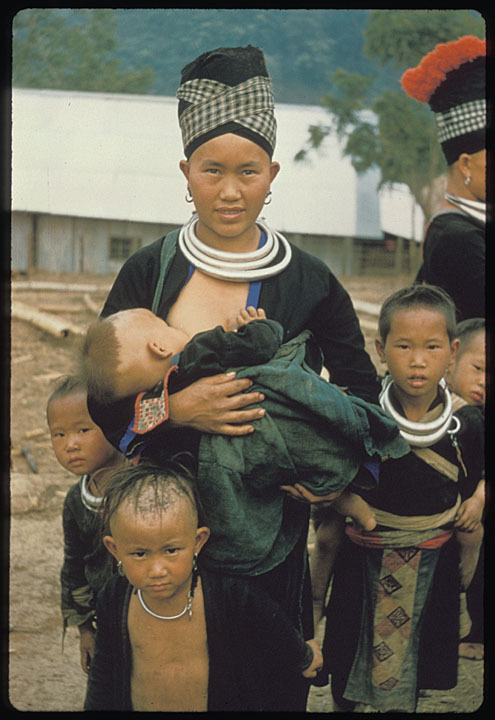 To the right are Mao Xiong (Mos Xyooj) (Orleans, France), Kia Keng Yang (Nkias Keem Yaj) (deceased), holding his son Bee Yang (Npis Yaj) (Rockwall, Texas), with Za Moua Yang (Zam Muas Yaj) (Nimes, France) on the far right. 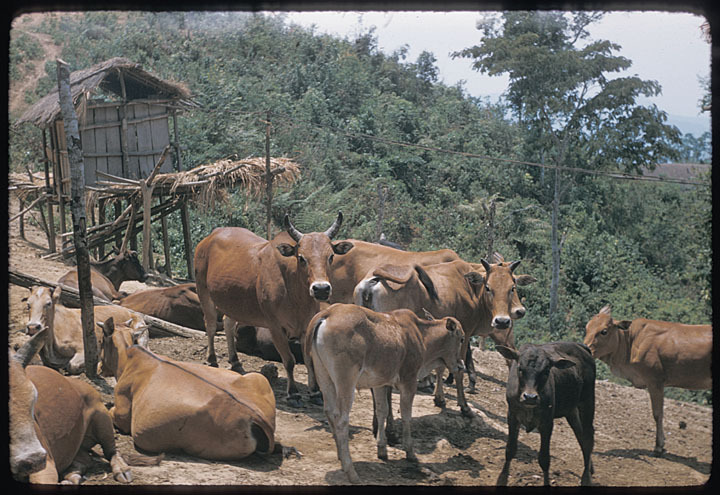 All of these people also appear in other images of Kiu Katiam. 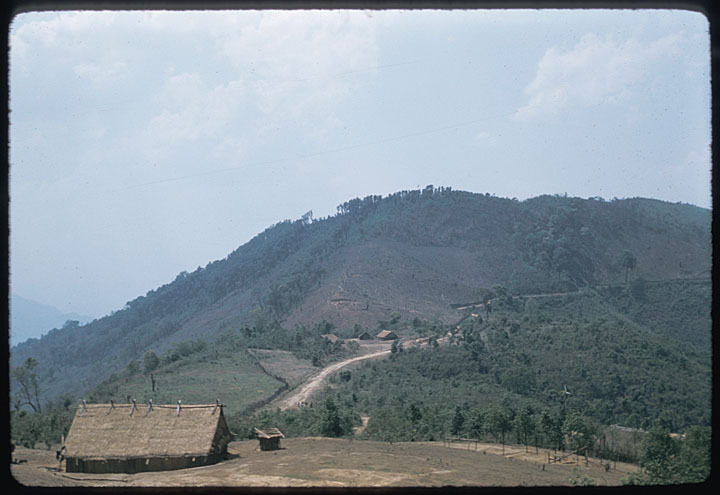 Also, especially noticeable in this image is, next to Va Khou Thao (Va Khwb Thoj)'s house, the wind tower which Father Yves Bertrais, a French missionary, introduced to the village. Thoj Hwj yog tus hnav tsho dawb. 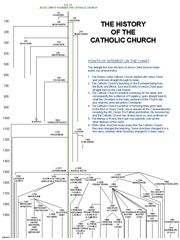 a former catechist, now residing in French Guyana. 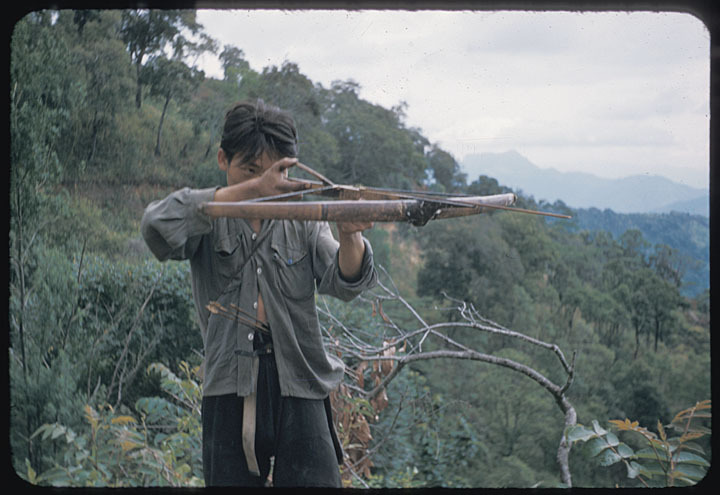 To the left of him, from left to right are Va Khou Thao (Vam Khwb Thoj) (deceased) with a rifle, Za Moua Yang (Zam Muas Yaj) (who now (2006) lives in Nimes, France) with what appears to be a cross around his neck, and Chue Tou Xiong (Tsuj Rwg Xyooj) (Orleans, France) to his right-front (his wife is also in this photo). 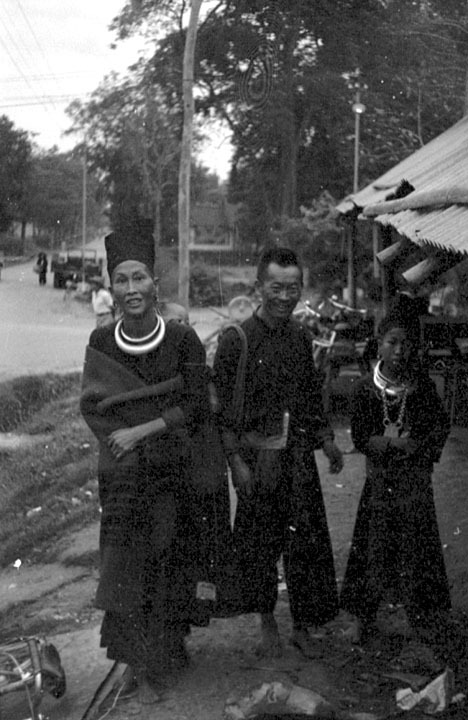 Kia Keng Yang (Nkias Keem Yaj) (deceased), who appears in several other Kiu Katiam images, is in the back with a plain black shirt front. 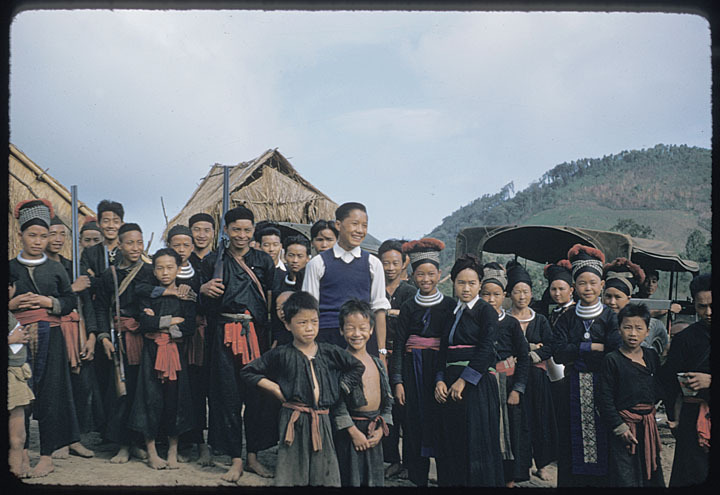 To his right-front, holding a rifle, is Za Nao Yang (Zam Nob Yaj) (deceased), whose wife and children appear in image 5-144c, with Yeng Yang (Yeeb Yaj) (Rennes, France) to his right-back, and Pa Lee Yang (Paj Lis Yaj) (California) next to him. 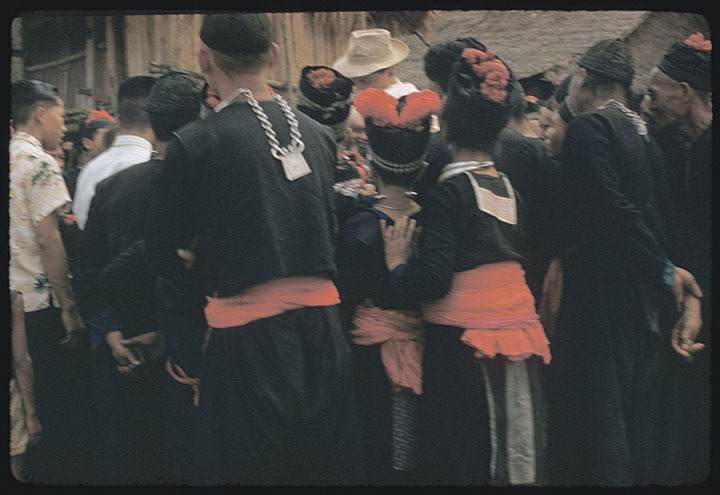 Three people to the right of Chue Hue Thao (Tshu Hwj Thoj) is his wife, Pa Lee (Paj Lis) (hands together), wearing a traditional costume of the Hmong of Xieng Khouang province. Between the couple are Chue Xiong Yang (Tsuj Xyooj Yaj) (French Guyana), in the back, and Yang Mee Thao (Yaj Mim Thoj). 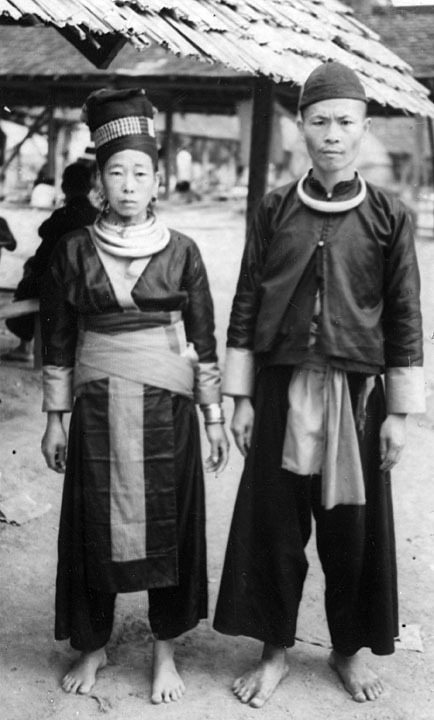 Two people to Pa Lee (Paj Lis)’s right-back is Mrs. Kia Hue Yang (Niam Nkias Hwj Yaj), mother of Chue Xiong Yang (Tsuj Xyooj Yaj) (in this photo) and Chong Yeng Yang (Txoo Yeeb Yaj). 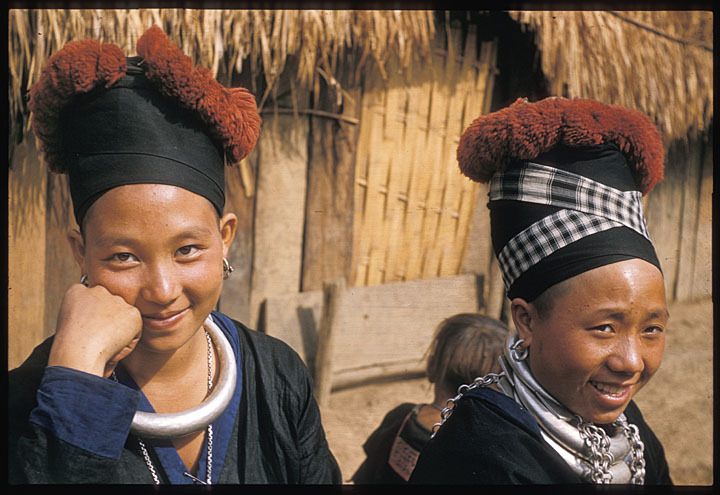 The next three women are Bee Xiong (Npib Xyooj) (Mrs. Npuag Foob Thoj) (Orleans, France), Yee Thao (Yiv Thoj) (Rennes, France), and Mrs. Chue Tou Xiong (Niam Tsuj Rwg Xyooj) (Orleans, France) – see images 6-4c, 6-1c, and 5-147a, respectively, for a close-up of each woman. In front of Chue Hue Thao (Tshu Hwj Thoj) are Sa Thao (Xab Thoj) (Castres, France), on the left, and Cheng Yang (Tsheej Yaj) (Orange, California). 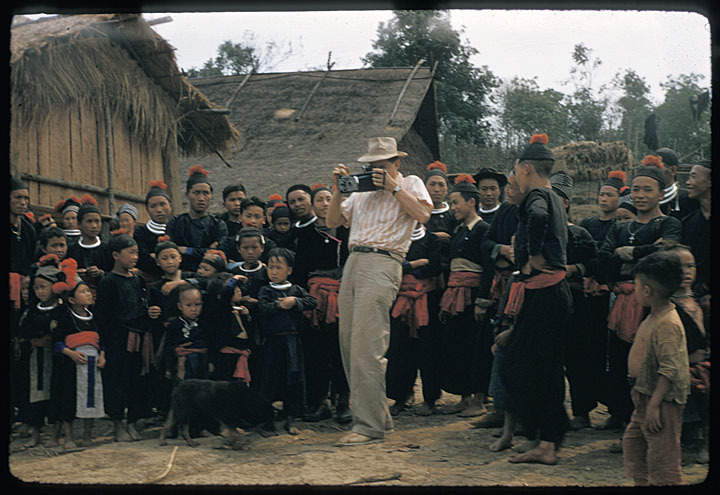 Halpern photographing in the White Hmong village of Kiu Katiam (Roob Nyuj Qus). 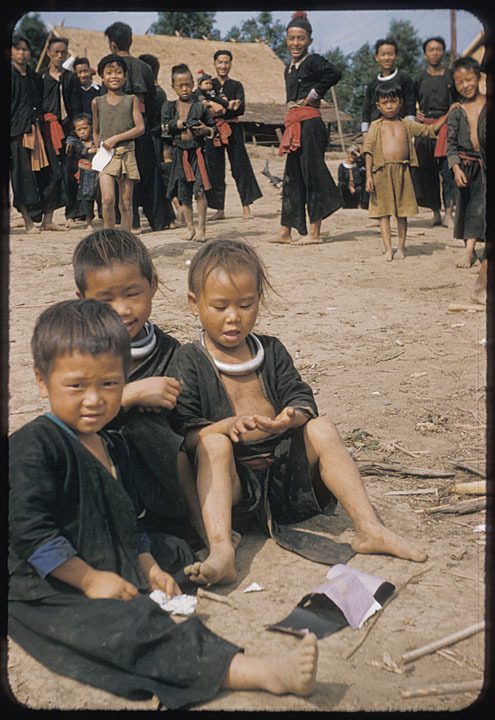 To the left of Halpern behind the children, from left to right are Cha Chai Thao (Tsav Ntxaij Thoj) (deceased), Bee Xiong (Npib Xyooj) (Mrs. Npaug Foob Thoj) (Orleans, France), Nao Neng Thao (Nom Neeb Thoj) (France) to her right-front, Cha Coua Thao (Chav Kuam Thoj) (deceased) two people to his right, then Boua Fong Thao (Npuag Foob Thoj) (deceased), with Za Nao Yang (Zam Nob Yaj) (deceased) and Chue Tou Xiong (Tsuj Rwg Xyooj) (Orleans, France) both immediately next to Halpern. 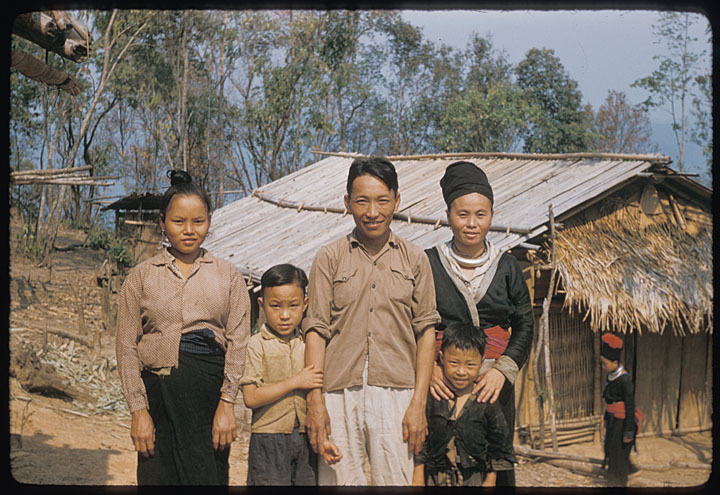 To the right of Halpern are, immediately, Nhia Xiong Yang (Nyiaj Xyooj Yaj) (deceased), Pa Lee Yang (Paj Lis Yaj) (California), and Ka Neng Thao (Nkaj Neeb Thoj) (Orleans, France), with Kia Thong Thao (Nkias Thoob Thoj) (deceased) further right without a silver neck ring to the left-back of Chia Yia Yang (Nchiav Yias Yaj) (Anaheim, California), who appears to be wearing a cross around his neck, indicating that he is a Christian. 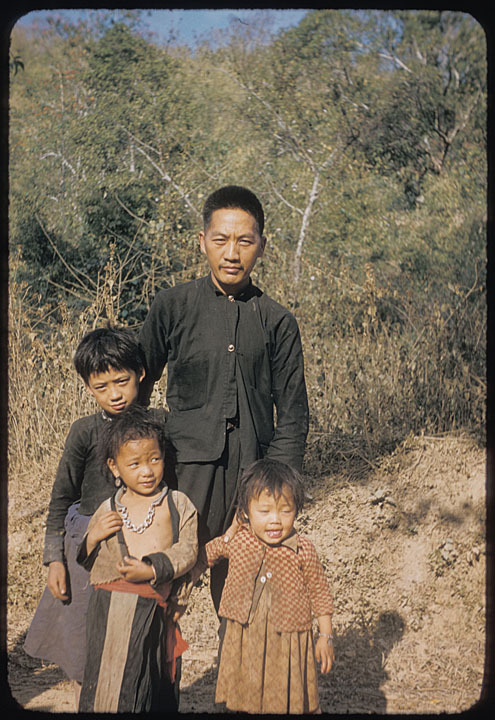 The children, from left to right, are Mai Yang (Maiv Yaj) (Madison, Wisconsin) on the far left next to Mee Yang (Mim Yaj) (Detroit, Michigan), each with a silver neck ring, then Gao Yang (Nkaub Yaj) (Orleans, France), with Sheng Yang (See Yaj) (Sacramento, California) to the immediate left of Halpern. 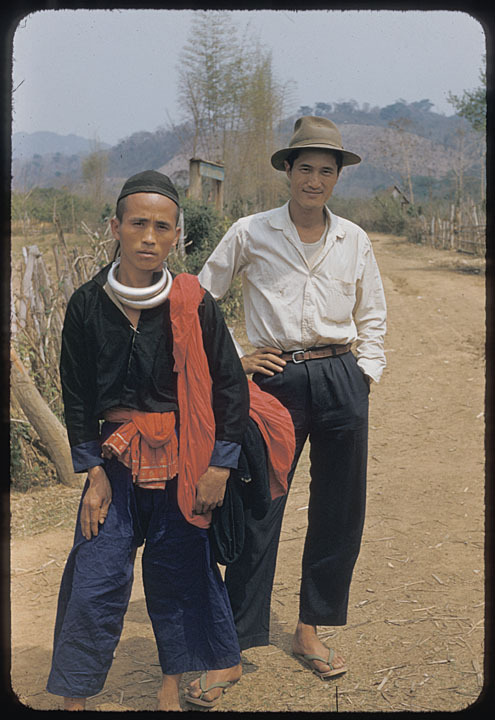 Halpern is six feet tall, which provides perspective on the relative size of the Hmong. 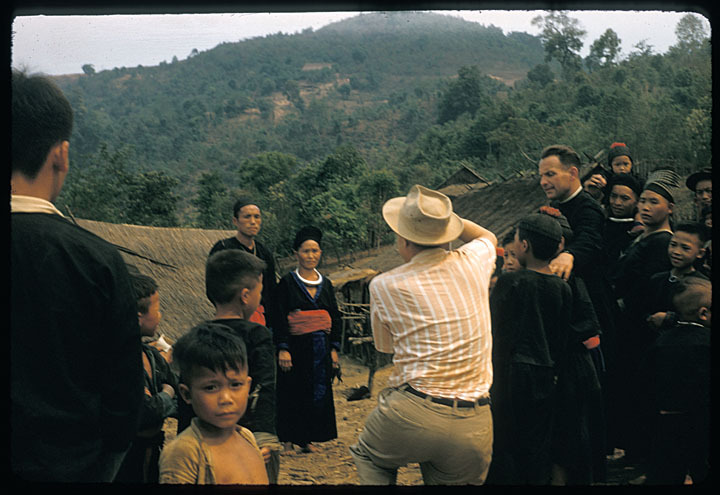 Description: Halpern taking a portrait of Cha Chai Thao (Tsav Ntxaij Thoj) and his wife, Shoua Yang (Sua Yaj), in Kiu Katiam, with Father Yves Bertrais, of the Missionary Oblates of Mary Immaculate and one of three co-founders of the Hmong Romanized Popular Alphabet (RPA), watching. 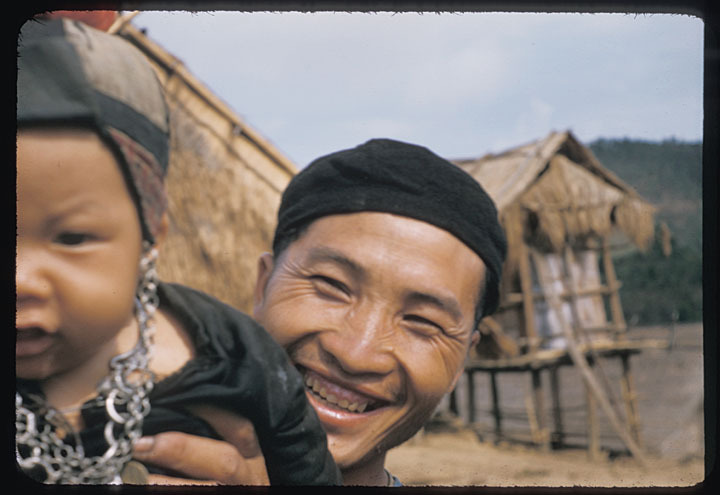 Cha Chai Thao (Tsav Ntxaij Thoj) was born in 1915 and died in 2007 in Castres, France. 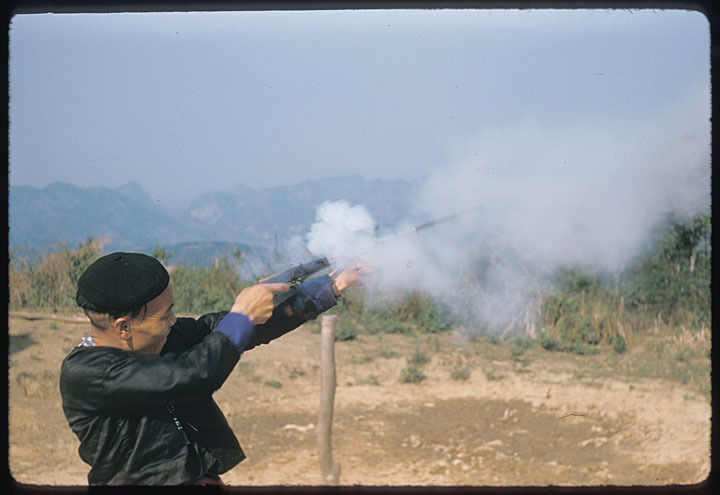 Shoua Yang (Sua Yaj) was born in 1920 and died in 2001 in Castres. They are the parents of Mai Thao (Maim Thoj) (now (2008) living in West Chicago, Illinois), Boua Fong Thao (Npaug Foob Thoj), Cha Coua Thao (Chav Kuam Thoj), Chue Hue Thao (Tshu Hwj Thoj) (French Guyana), and Nao Neng Thao (Nom Neeb Thoj). 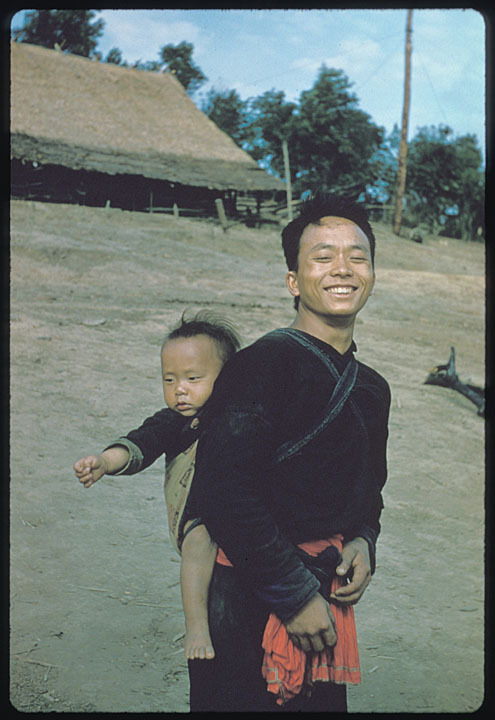 To Father Bertrais' immediate right are Za Nao Yang (Zam Nob Yaj) (raising a child) and then Kou Yang (Khu Yaj). The photograph Halpern is taking was with a Polaroid camera and presented to the couple. Therefore it does not exist in this collection. Making presentation photos was a frequent practice. Za Nao Yang (Zam Nob Yaj) is now deceased. 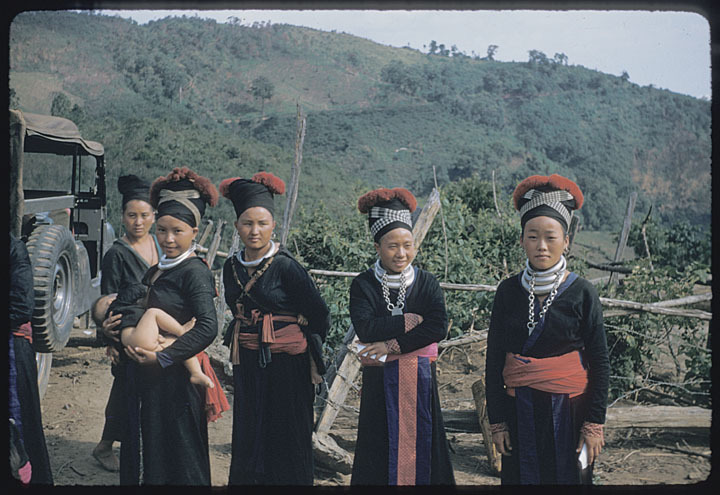 The boy in the foreground is a Kammu, the son of Phou Va.
Four White Hmong women, from left to right, Yang Mee Thao (Yaj Mim Thoj), Yee Thao (Yiv Thoj), Mao Xiong (Mos Xyooj), and Ka Yeng Her (Kab Yeeb Hawj) (Mrs. Soob Tooj Yaj), pose for the camera. 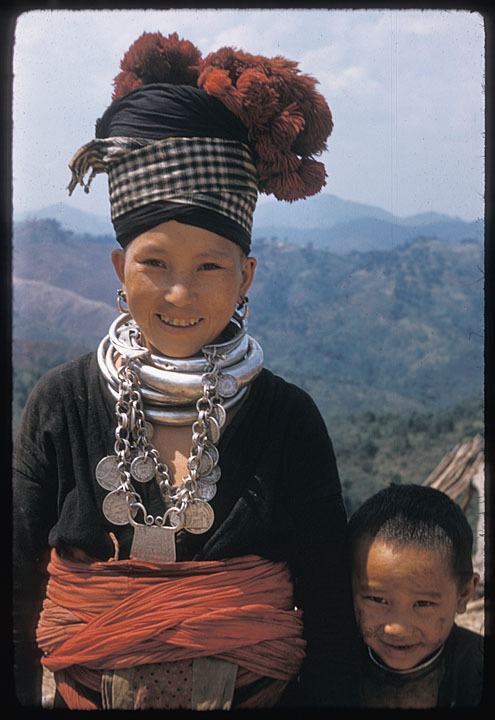 Their silver rings are characteristic of the Hmong and display their relative wealth. 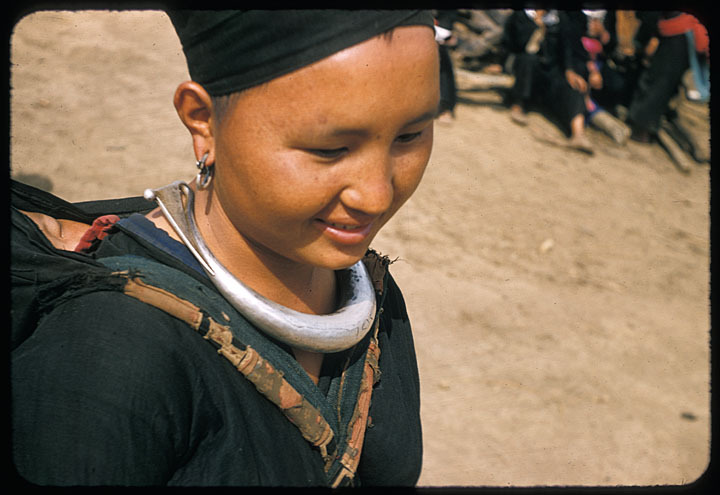 Notice that Yee Thao (Yiv Thoj) is also wearing a necklace with a cross pendant, indicating that she is a Christian. Yang Mee Thao (Yaj Mim Thoj) now (2006) lives in Cacao, French Guyana, Yee Thao (Yiv Thoj) in Rennes, France, while Mao Xiong (Mos Xyooj) and Ka Yeng Her (Kab Yeeb Hawj) (Mrs. Soob Tooj Yaj) are in Orleans, France. 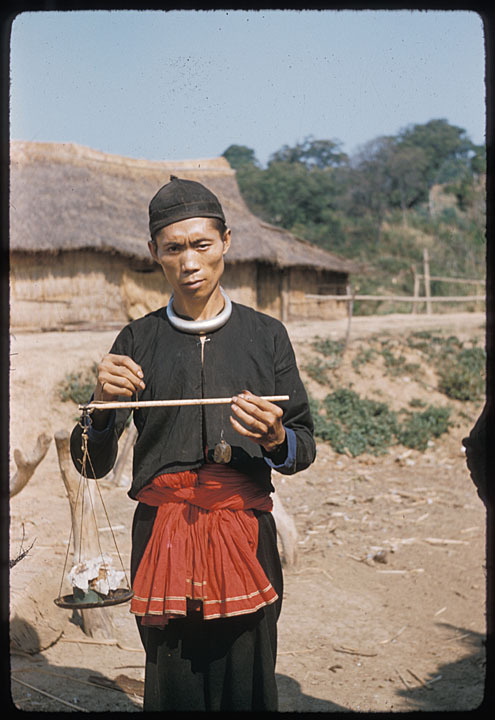 Mrs. Song Tong Yang (Niam Soob Tooj Yaj)'s husband posed in image 5-136c. 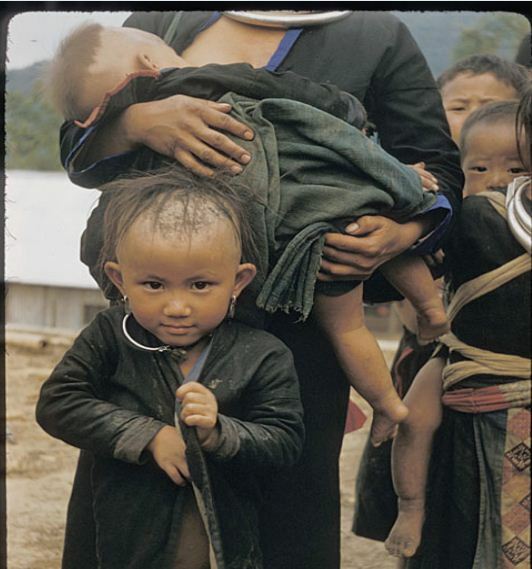 The baby at the left appears to be Bee Yang (Npis Yaj) (Rockwall, Texas), held by his father, Kia Keng Yang (Nkias Keem Yaj) (deceased), as the pair can be clearly seen in several other Kiu Katiam pictures. 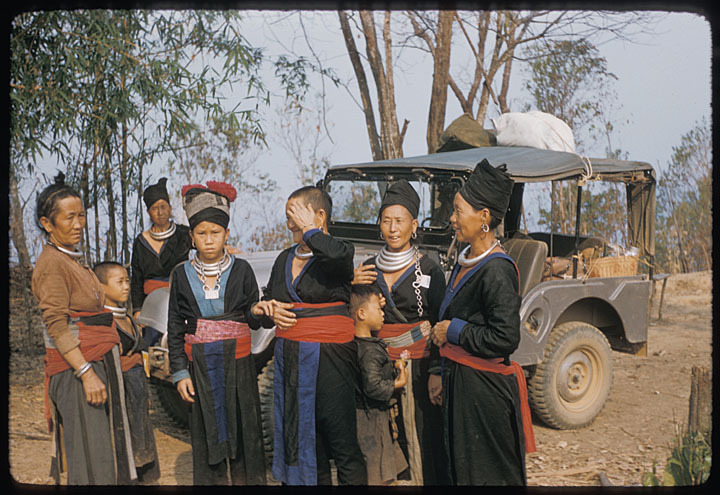 These White Hmong women near Halpern's Jeep are, from left to right, Mrs. Chue Xiong Yang (Niam Tsuj Xyooj Yaj) (who now (2006) lives in French Guyana), Mrs. Chue Tou Xiong (Niam Tsuj Rwg Xyooj) (Orleans, France), Bee Xiong (Npib Xyooj) (Niam Npuag Foob Thoj) (Orleans, France), Mao Xiong (Mos Xyooj) (Orleans, France), and Dia Yang (Diav Yaj) (France). 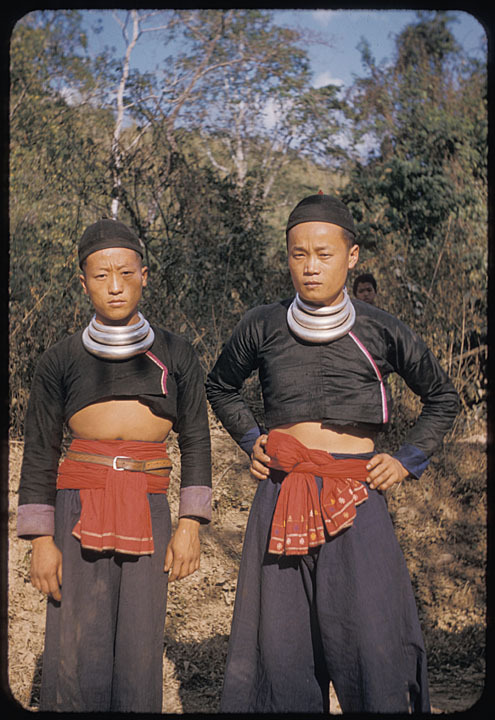 Their silver neck rings are characteristic of the Hmong and serve to display a family's relative wealth. It is unclear what the two women on the right are holding in their hands, though it may be polaroids of themselves taken by Halpern. 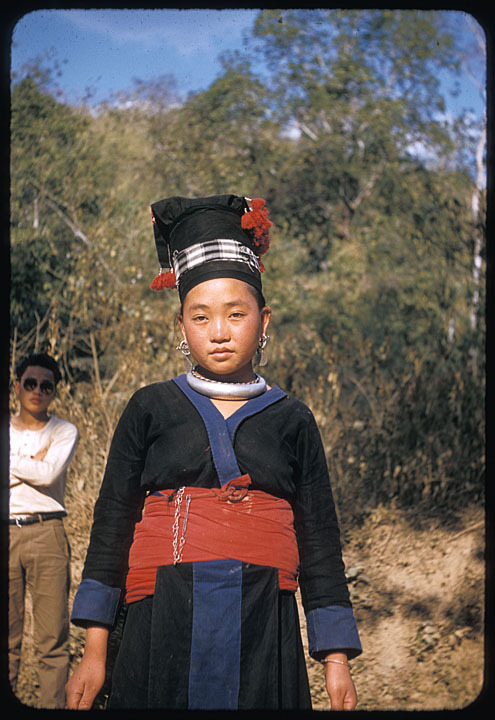 For a close-up of Mao Xiong (Mos Xyooj)'s upper body and face, see image 6-4c. 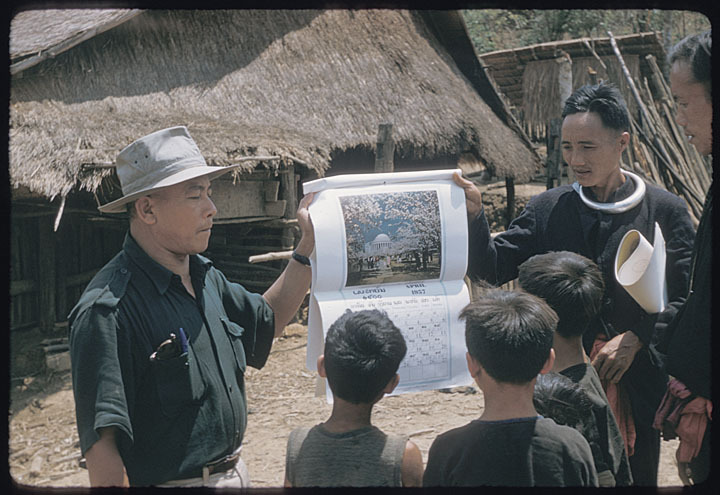 Dia Yang (Diav Yaj) served as a valuable secretary at the Missionary Oblates of Mary Immaculate (OMI)'s Vientiane, Laos center for 15 years (until 1975). 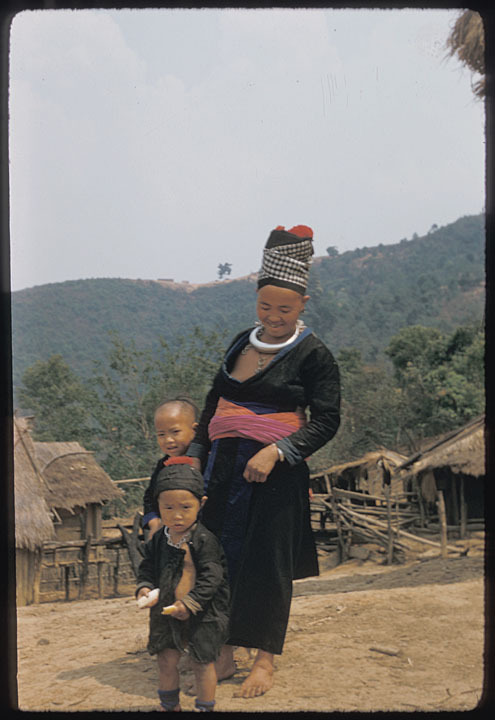 The husbands of Mrs. Chue Xiong Yang (Niam Tsuj Xyooj Yaj), Mrs. Chue Tou Xiong (Niam Tsuj Rwg Xyooj), and Mrs. Boua Fong Thao (Niam Npaug Foob Thoj) appear in images 5-143a, 5-143b, and 9-33a respectively. Hmoob Roob Nyuj Qus ntsauv yawg Halpern, tuaj tsham lawv. 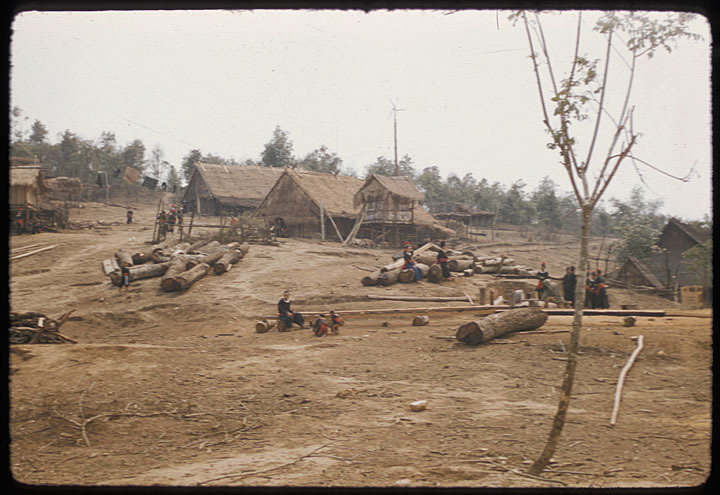 Many Hmong were interested in establishing schools in their villages. 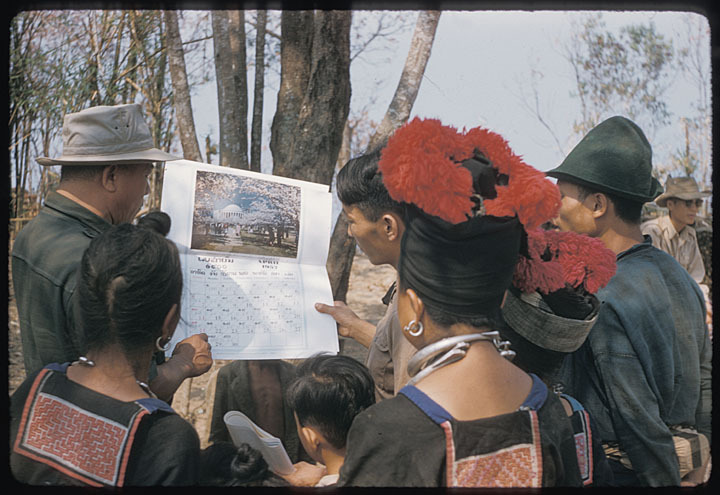 Here, the Lao Inspector of Education from Luang Prabang Province shows two men, Boua Neng Xiong (Npuag Neeb Xyooj) and Cha Chai Thao (Tsav Ntxaij Thoj) (on the right), as well as younger White Hmong villagers in Kiu Katiam a Laotian calendar as they discuss the process for opening a school. This calendar was printed by USIS and has a picture of the Jefferson Memorial in Washington, D.C. at cherry blossom time. 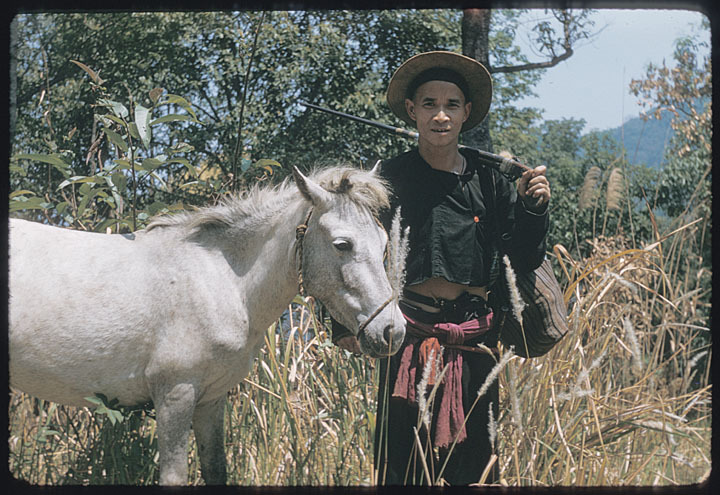 Cha Chai Thao (born in 1915) died in Castres, France in 2007. 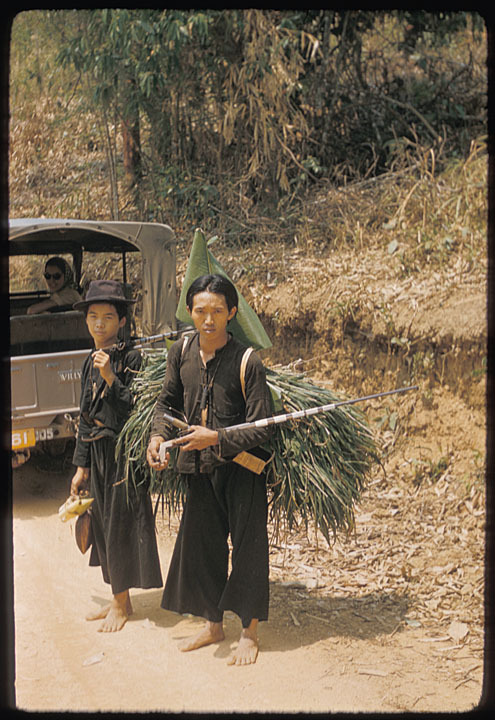 See image 9-33b for a picture of him together with his wife, Shoua Yang (Sua Yaj) (deceased). 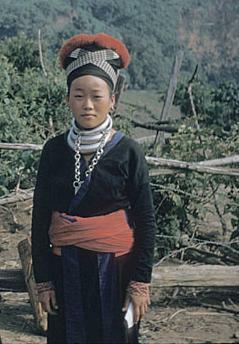 Boua Neng Xiong (Npuag Neeb Xyooj) is deceased. 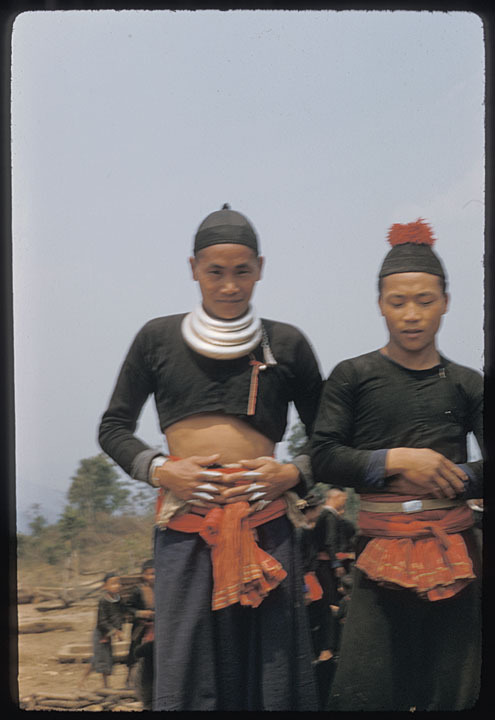 Chue Da Yang (Tswv Ntaj Yaj) (deceased) stands in the middle with Boua Neng Yang (Npuag Neeb Yaj) (Fresno, California) to his left. 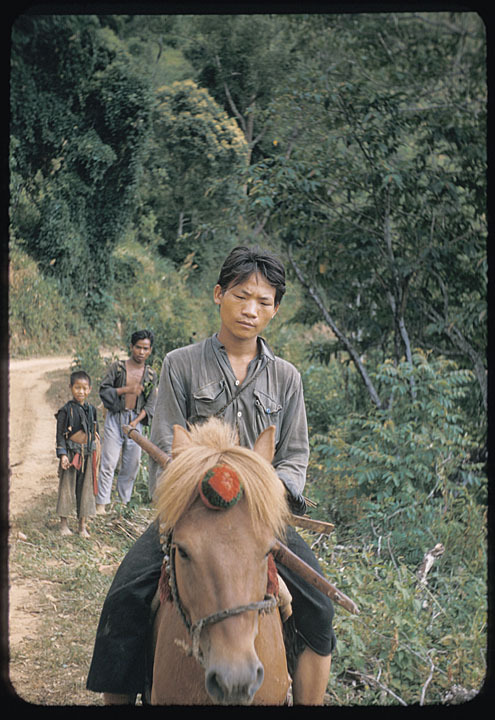 The pony helps lighten the men's load by carrying heavier items in the baskets slung on its back. 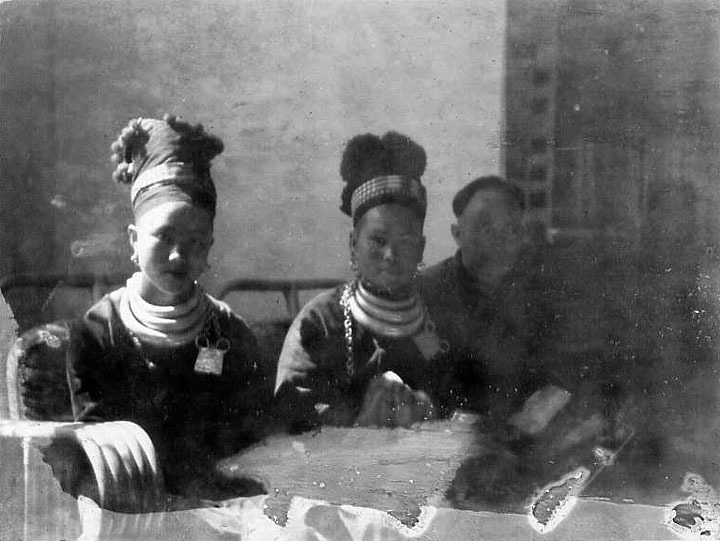 Notice that Boua Neng Yang (Npuag Neeb Yaj) is wearing expensive silk clothing. Silk clothing is not typically worn on an everyday basis, indicating that this may be a special occasion for this him. Cov nov yog leej twg, nej puas paub npe? Nyob Roob Nyuj Qus. 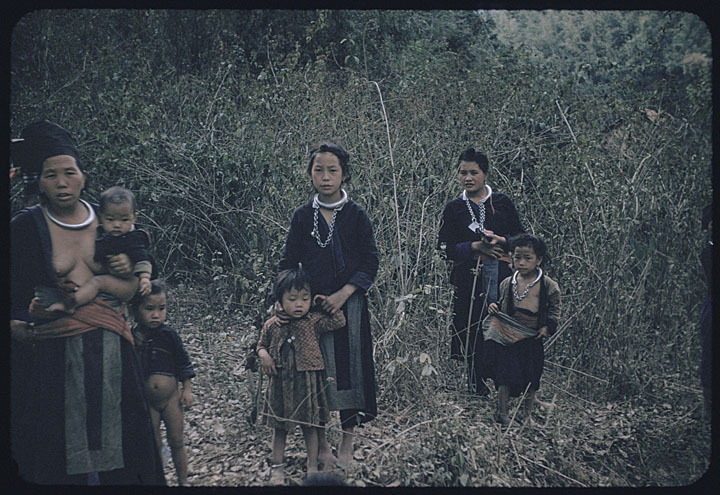 Mrs. Nhia Xiong Yang (Nyiaj Xyooj Yaj) is surrounded by children, including her daughter Ka Yeng Yang (Kab Yeeb Yaj) in front. 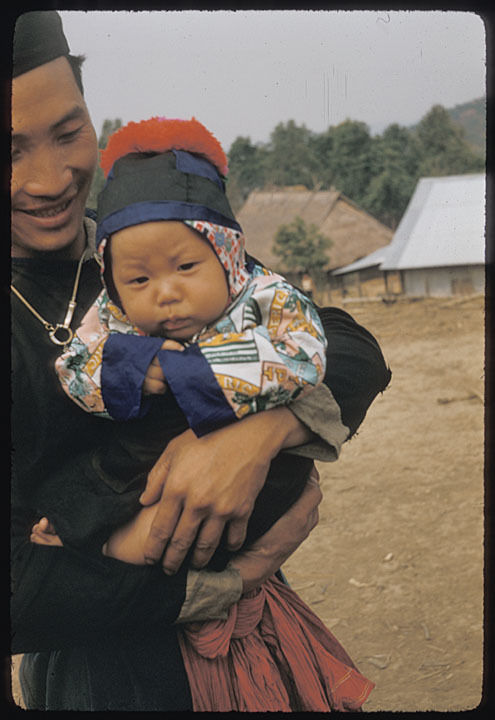 Mai See Thao (Maiv Xis Thoj), wearing an intricately decorated apron with designs that are typical of Hmong embroidery, is carrying a child on her back. 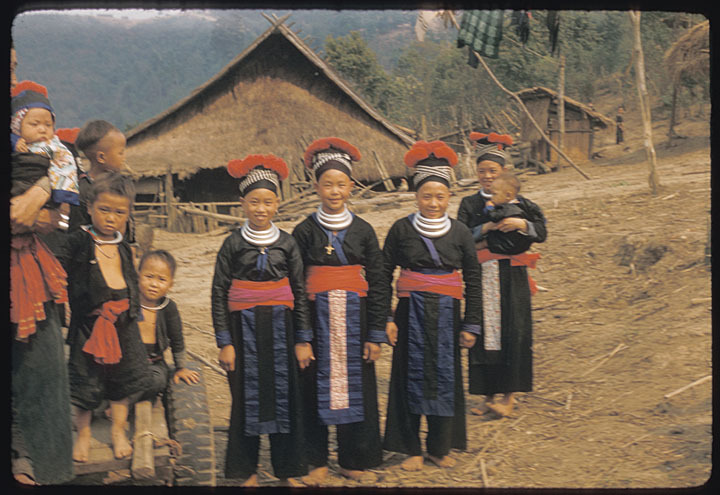 It is common for Hmong girls to be actively involved in the care of younger siblings. 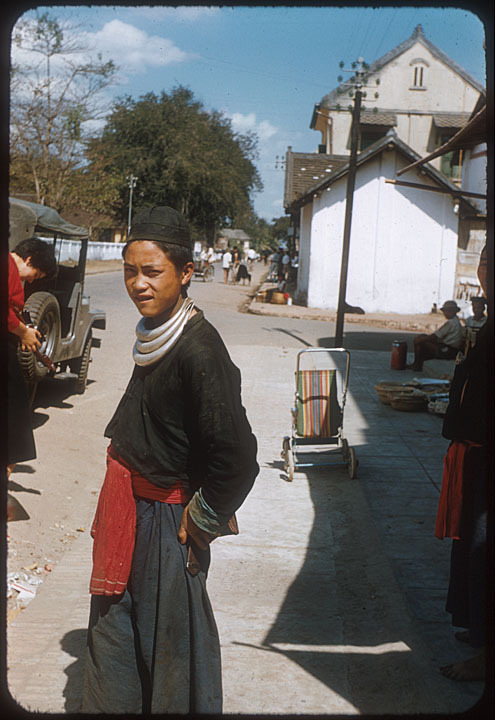 Her sister Bai Thao (Npaim Thoj) is on the other side. Mrs. Nhia Xiong Yang (Nyiaj Xyooj Yaj) now (2006) lives in Saint-Didier, France, and Ka Yeng Yang (Kab Yeeb Yaj) in Carpentras, France. 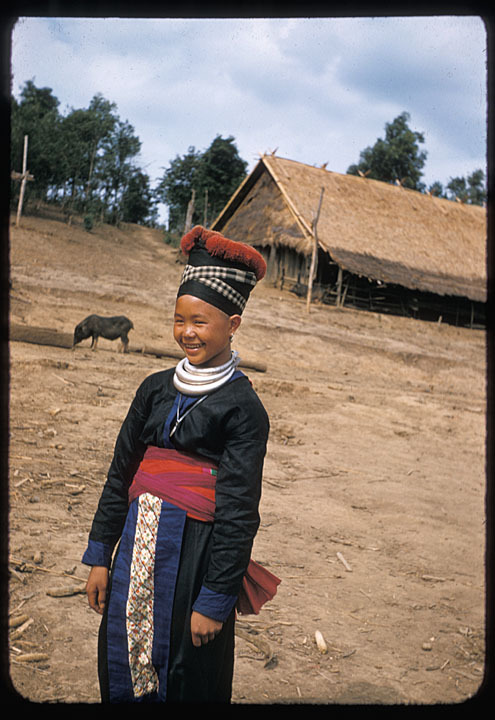 Mai See Thao (Maiv Xis Thoj) (2007) lives in California and Bai Thao (Npaim Thoj) in France. Father Yves Bertrais' new house is in the background. 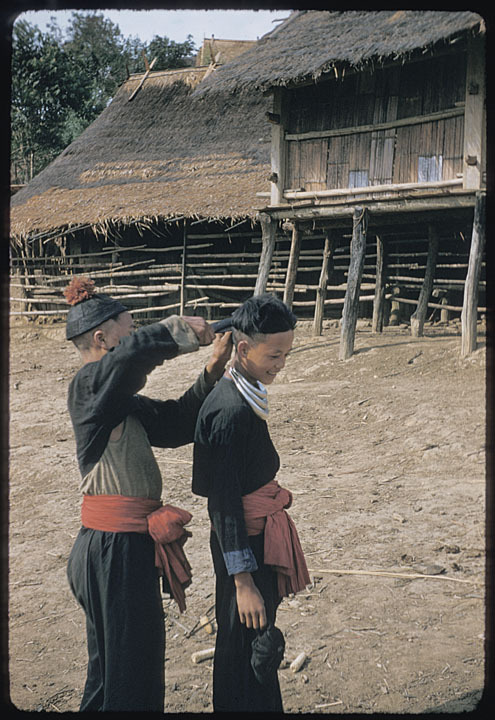 Ka Yeng Yang (Kab Yeeb Yaj), a White Hmong girl, holds her tunic closed while Mai Xee Thao (Maiv Xis Thoj) clasps Mrs. Nhia Xiong Yang (Nyiaj Xyooj Yaj)'s arm in the village of Kiu Katiam. The new house of Father Yves Bertrais can be seen in the background. 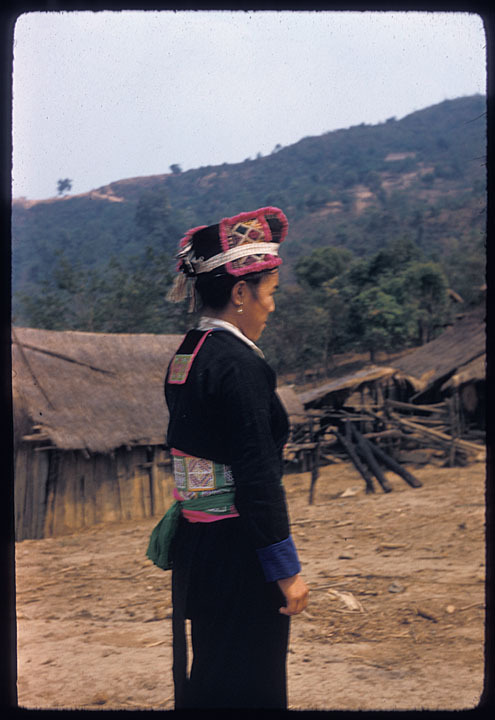 See image 5-145a for a fuller view of Mrs. Nhia Xiong Yang (Nyiaj Xyooj Yaj) and Mai Xee Thao (Maiv Xis Thoj). 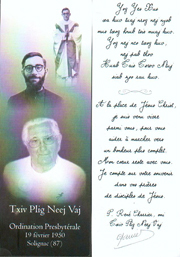 Ka Yeng Yang (Kab Yeeb Yaj) now (2006) lives in Carpentras, France, Mrs. Nhia Xiong Yang (Nyiaj Xyooj Yaj) in Saint-Didier, France, and Mai Xee Thao (Maiv Xis Thoj) in California. 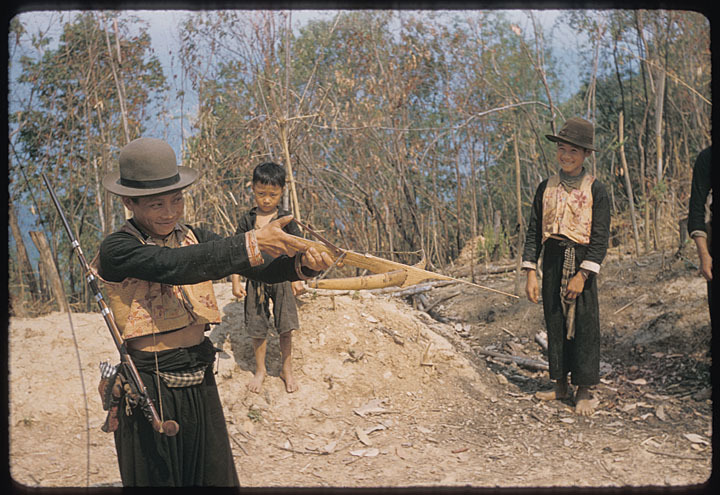 Three White Hmong children – in the foreground is Cheng Yang (Tsheej Yaj) (who now (2006) lives in French Guyana), with Mai Thao (Maim Thoj) (West Chicago, Illinois) and Mee Yang (Mim Yaj) (Detroit, Michigan) behind from left to right -- play as villagers mill about in Kiu Katiam. They seem to be playing with polaroid paper left over from a snapshot taken by Halpern during this visit to the village. 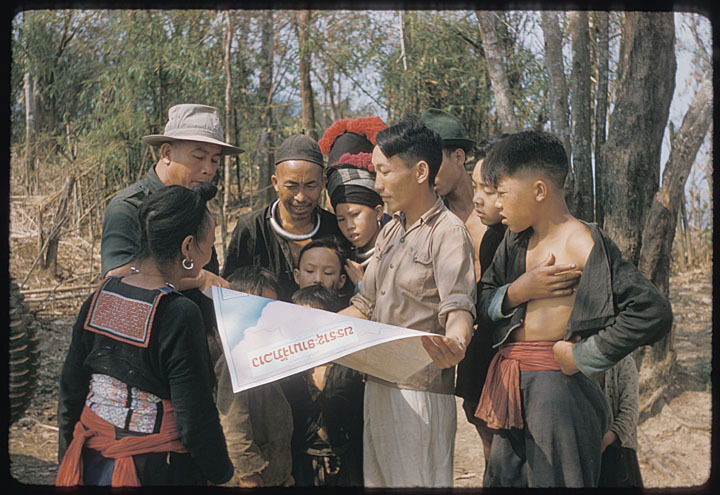 Standing second and third from the left are Cha Chai Thao (Tsav Ntxaij Thoj) (Castres, France) and Yeng Yang (Yeeb Yaj) (with a white collar), respectively. 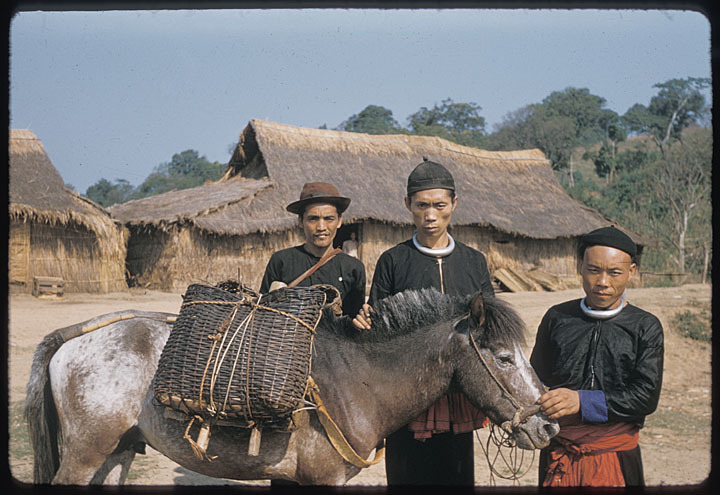 Kia Keng Yang (Nkias Keem Yaj) (deceased) is in the center holding his son, Bee Yang (Npis Yaj) (Rockwall, Texas), with Tong Xiong (Thoob Xyooj) (Javouhey, French Guyana) to his left-front and Pa Lee Yang (Paj Lis Yaj) (California) to his right. 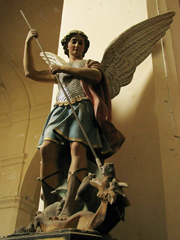 A part of the pole for a wind tower introduced by Father Yves Bertrais, a French missionary, can be seen in the background. 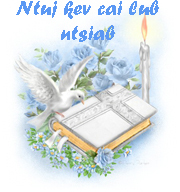 Nchaiv Yias Yaj ev Yaj Txhiaj. 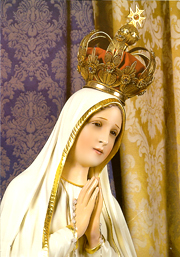 Nkias Neeb Thoj sab lauj, Txooj Tsawb Thoj tus sab xis. Leej twg puas paub ob tug nov npe, yog Hmoob Roob Nyuj Qus thiab? 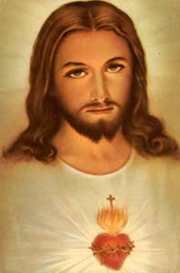 Paj Lis, niam Tshuv Hwj Thoj. Vaj Swm Looj thiab nws ob tug poj niam. 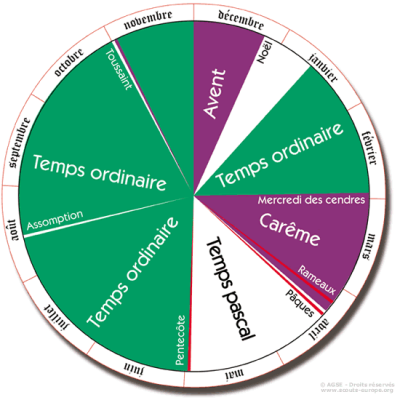 Tsis paub npe, yog koj tuaj zeem tau koj niam, koj txiv, koj pog koj yawg no kuv zoo siab yuav txais tos koj lo lus qhia rau kuv paub. Cov duab nov TXWV tsis pub coj mus siv rau lwm qhov, los yog copy cia. Coj tuaj rau nej saib hauv nov xwb. Hahhah...! Admin, Yuav hais lus rau kuv muaj siab ua luaj li...Hahahah...! Kuv pom kuv lub npe nyob ntau heev, kuv twb txuag maj lawm los nws tseem qhua kom kuv zoo siab thiab...Ua tsaug rau nws kev txhawb siab txhawb zog nawb mog. kuv mus ncig pom 1 daim video lawv kuj tias yog zos roob nyuj qus thiab tab sis kuv tsis paub tias puas yog tiag vim thaum peb nyob roob nyuj mas kuv tsis paub dab tsi li. Ua koj tsaug koj tuaj tso daim video no rau peb saib. lub zos no yog zos Roob Nyuj Qus tiag tiag li nawb. 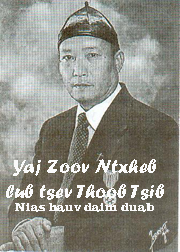 Vim lawv yeej tsom pom ob lub roob koos lub zos tuaj nruab nrab. 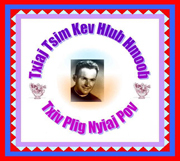 Tsuas yog tam sis no Hmoob ua tsev nyob taug ntug kev lawm xwb sub, thiab lawv ua lag ua luam loj lawm.